When I heard the Red Hot Chili Peppers were hanging out with Bronson Arroyo, I expected a lot more homoeroticism. 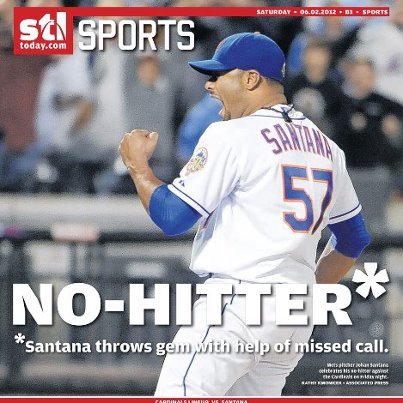 The New York Mets finally got their first no-hitter in team history, and the St. Louis Cardinals were unlucky enough to be the opposing team. The city’s newspaper covered it with the grace and style you would expect from the city of the self-proclaimed “Best fans in baseball.” Just kidding. They whined and added an asterisk to the headline for Johan Santana’s historic achievement. Considering the Cardinals history of whining–in Reds’ games and in games against others–makes me think this headline needs a little modification. There, isn’t that much better? Posted in Cincinnati Reds, NL Central, Pretend Captions, St. Louis Cardinals. I’m sure the Cincinnati Reds can use the day off after playing about 100 games in a row away from home and losing 80 of them*. But I always miss baseball, even after stretches like that. Of course, a bunch of those games were during the day while I was at work, so it was kind of like they were off days to me, anyway. 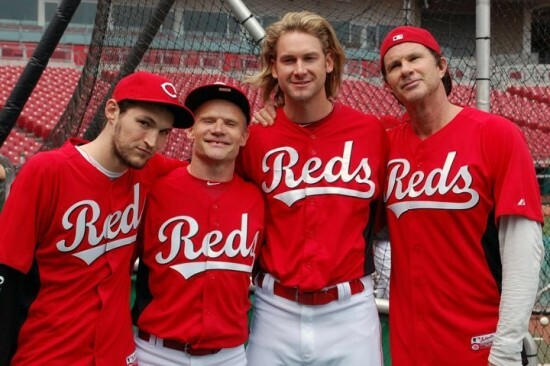 But today is an actual off-day before the Reds start a series at home with the San Francisco Giants tomorrow. Finding content when the team doesn’t play can be challenging. Redleg Nation listed reasons the season isn’t over. Red Reporter whipped out the calculator and the maths and stuff to see what kind of holes are in the Reds’ bats. And C-ing Red makes fun of a billboard that the Chicago Cubs have in the outfield. But all that sounds like work. 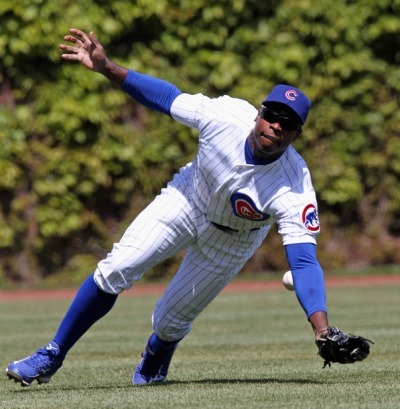 So instead, here’s a picture of Alfonso Soriano missing a routine fly ball. He misses fly balls and could be yours for just $57 million over 3 years! Posted in Chicago Cubs, Cincinnati Reds, NL Central, Pretend Captions, Random Ramblings. Was it only two years ago that Homer Bailey looked like an old woman when he pitched? Some guys work on their pitching mechanics, but Bailey’s worked on his pitching face. Denis Phipps acts like he’s never seen home plate from this vantage point before.